The e-learning materials have been developed by staff who have a nursing qualification and expertise in either health visiting or school nursing. The sessions have been tested with a number of Health Visitors and School Nurses, alongside a range of stakeholders and relevant networks. The pilots for the face-to-face training element include participants from School Nursing and Health Visiting. A broad geographical spread of participants has been sought. The first module is focused on the role of Health Visitors and School Nurses in supporting children and young people living with complex needs and include those with long-term medical conditions, life-limiting illnesses, autism, hearing and visual impairments, cerebral palsy and special educational needs. The second module is focused on the role of the Health Visitor and School Nurse in understanding the risk factors of and promoting positive emotional health and wellbeing. It also considers more specific mental health and illnesses. Up-to-date resources are included to support learners, providing opportunities for further research and an improved knowledge base. As a result of the training delivered, Health Visitors and School Nurses are enabled to pass on the training (including any materials where relevant) to colleagues. The training ensures that Health Visitors and School Nurses are adequately prepared and have an appropriate level of understanding to support peers undertaking the training themselves. This will be tested through self and tutor assessment and evaluation during and after the training. In summary, this programme provides a curriculum with high-quality training materials. The identification of key challenges for wider rollout of training, and possible mitigating actions for these challenges will be discussed and agreed by the project team and reported back to Department of Health and Public Health England. The film below illustrates a ‘Champions day’ which took place for trainers of Health Visitors and School Nurses, where the vision for the e-learning programme was outlined in detail. Module 1 provides an overview of complex and additional needs. It considers common issues relating to children and young people with additional or complex needs and comprises three sessions. Physical Health including long term conditions and life limiting illnesses. Physical Disability including cerebral palsy, hearing or sight impairment. Special educational needs including learning disability and autistic spectrum disorder. Module 2 provides an overview of common topics related to children and young people’s emotional health and wellbeing and comprises three sessions. Understanding the emotional health and wellbeing of children and young people. Risk factors and early warning signs to avoid crisis. Mental health and mental illness in children and young people. A number of resources have been developed to help support trainers in disseminating this e-learning further. This includes documents summarising the key messages from the e-learning programme and tutorial forms to enable trainers to highlight pre-reading and further reading resources available in the e-learning programme. These resources can be downloaded from this link. The film below explores the experiences of Lynne Watson, a Health Visitor, whose son has had complex physical needs. We would encourage the use of this film as part of training materials for Health Visitors and School Nurses. 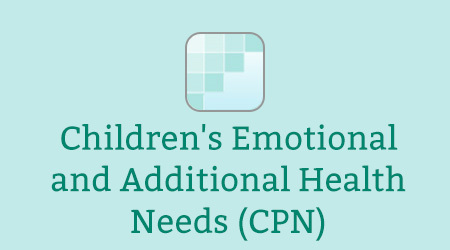 The Children’s Emotional and Additional Health Needs programme is freely available to access here. If you already have an account with e-LfH, then you can enrol on to the Children’s Emotional and Additional Health Needs programme by logging in to the e-LfH Hub, selecting My Account > Enrolment and selecting the programme. You can then access the programme immediately in the My e-Learning section. The Children’s Emotional and Additional Health Needs programme is also available to NHS healthcare staff via the Electronic Staff Record (ESR). Accessing this e-Learning via ESR means that your completions will transfer with you throughout your NHS career.